This is a screenshot form my PC, so I do not expect it to be quite the same on my phone. What symbols and other cues do I need to pay attention to make a good decision as to which route should be taken. I understand there is construction on the A1 and can halt traffic. You can select one of the routes by tapping the estimated time labels. Right now (Wednesday, 8am) there's slow traffic near the airport, but it still takes 30min for 30km, which is not that bad. Google also does not suggest an alternative around that little jam. The only advantage of the desktop version is that you can give a time, an it it shows how long the trip should have been when in the past, or a prediction when in the future, calculated from collected traffic information. I didn't find that in the app. Your third route was done by dragging the generated route by mouse, i.e. adding intermediate stops. The app provides this function, too. You can't drag the route, you have to add a stop and can select it from the map. My personal experience is that Google route planning is really good since it knows the traffic status much more precisely than any other device or service, due to the information it gets from all the Android phones on the streets. Not the answer you're looking for? Browse other questions tagged online-resources netherlands maps mobile-apps or ask your own question. 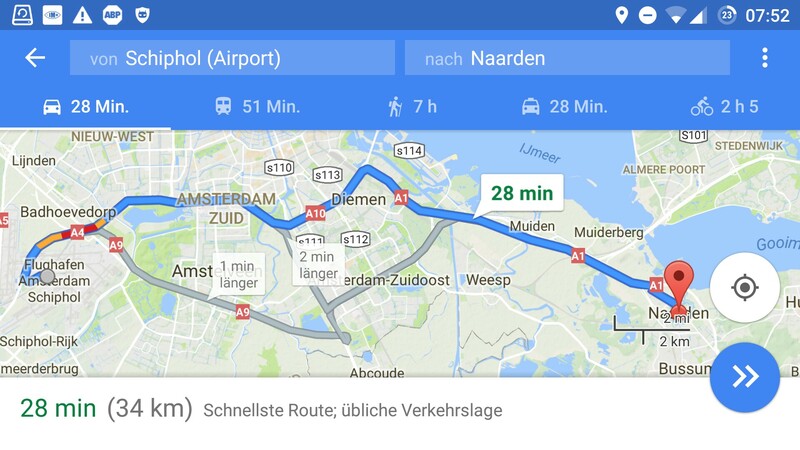 How accurate is Google Maps for travel times? How is the range of Google Maps new drive time feature defined?